He is the current President of Venezuela. As the leader of the Revolution Bolivar, Chávez mempromotori vision of socialist democracy, Latin American integration, and anti-imperialism. He also sharply criticized the neoliberal globalization and U.S. foreign policy. He was president since 1998. He was the son of a teacher and a graduate of the Military Academy. Chavez won an engineering degree in 1975 and his huge fan of baseball. After his election as president in 1998, he experienced repeated shocks of government. He was threatened with death (2000). However, he received the mandate six-year tenure in the year to undertake political reforms. On 14 November 2001, President Hugo Chavez announced a series of measures aimed at stimulating economic growth including legislation enacted land reform that sets out how the government can take over idle land, private land, and the Hydrocarbons Law enacted promising flexible royalties for companies that mine mengiperasikan oil state. Economic policies considered controversial, especially concerning the Reform Act land, of which gives the authority to the government to take over the real estate companies and the vast agricultural lands that are considered less productive protests of millions of people in the capital, Caracas (December 11 2001). In addition, Bolivar currency slumped 25% fall against the dollar after the government abolished the control of the exchange rate has been maintained five years. In April 2002, an estimated 150,000 people rallied, led by Carlos Ortega and Pedro Carmona, which aims to support the strike and protest oil. While at the same time, thousands of Chavez supporters were around the palace, showing their allegiance to the democratically elected president is. Unilaterally, opposition parties staged demonstrations strike suddenly change route set, turn towards the palace so that the fears of clashes spurred protests in Caracas mayor Carlos Ortega as the person deemed responsible for the demonstrators carried. Clashes ensued between the two great masses, who tried Lerai by security. But amid the clashes, gunshots rang out. Obviously, in the future, the results of the documentation and information gathering, is known to have snipers hiding. At that time, nearly 25% of the Venezuelan population has a gun. No exception with those who are in a big demonstration. The shots were directed, both by supporters of Chavez and the opposition do not know anything, the direction of fire from snipers. However, the show presented by private television largely owned by the opposition to Chavez, as suggested by Chavez supporters shooting with brutal on the opposition protesters. The incident killed 10 people killed and 110 others injured. President Chavez instead of prohibiting acts of violence covered by the television, and even the actions are exaggerated by the media are anti with Chavez as fault and responsibility Chavez. Despite the fact they hide the fact that both Chavez and opposition supporters, at the same time both a target snipers. At that time, the dissident military officers expect Chavez to resign. A decade before the coup, Hugo Chavez formed a movement with a group of military officers named Simon Bolivar (Father of Independence of Latin America). Policies of President Carlos Andres Perez raised petrol prices and tightening waist protests from the masses seem appropriate if "tool" used immediately. Moreover, having regard to the riots for three days (27 February 1989). Hundreds of people were killed. Many bodies remain unidentified in a tomb. Such can not wait anymore, Lieutenant Colonel Hugo Chavez led about 5,000 soldiers to do the bloody coup on February 4, 1992 despite reap failure. Revolution in February by the Revolutionary Bolivarian Movement claimed the lives of 18 people were killed and 60 others injured. Chavez then surrendered. He then languishing in prison while his colleagues attempted military seized power again nine months later. The second coup attempt in September 1992 also failed. Hugo Chavez locked up two months in prison. While in prison, he formed a party called the 5th Republic Movement (Movement of the Fifth Republic), and make the transition from military to political. After the break-up of dissidents as well as a television station had broadcast a recording of Chavez, who announced the fall of the government in power, he was sentenced to prison for two years. Chavez then get forgiveness. Outside the prison, he launched his party's Fifth Republic Movement, and the transition from world to world armies politician. Chavez, who led a coalition of leftist Patriotic Pole clearly asserts, following in the footsteps of legendary figures Argentina (Gen. Juan Peron), which is considered very concerned about people's welfare, social justice, and equality. President Hugo Chavez resigned under pressure from the military leaders of Venezuela in the early morning of Friday 12th April 2002. Dramatic coup by the military on the president to develop a dilemma situation. A few hours after Chavez resign, Pedro Carmona was appointed as interim president (interim). However, the Attorney General of Venezuela (Isaias Rodriguez) stated that the appointment of interim President Pedro Carmona was inskontitusional and stressed that Venezuelan President Hugo Chavez remains. According to the Attorney General, the resignation of the new president of the official receipt of Congress. Chavez resigned under pressure from military leaders. "Mr. President, first I completely loyal. However, the loss of life that occurred, can not be tolerated, "said Gen. Ephraim Vazguez Velasco (Commander in Chief) in a speech on national television quoted the Indonesian press. In the middle of the flow of international criticism of coups d'etat, the military appointed an economist named Pedro Carmona who was one of the leaders of the Chamber of Commerce. At the inauguration of the interim president, Carmona announced immediate presidential elections within a year. Congress also dismissed as a supporter of Chavez. In one edict that declared the interim government also revealed the formation of a Consultative Council comprising 35 members. They took over as president of the advisory body of the republic. The decree also stipulates, interim president of the transitional government will coordinate policy and other decisions necessary to ensure the policy, the central government and local authorities. The decree invited much criticism. Mexican President Vicente Fox stated firmly Venezuela does not recognize the new government until new elections held. Similarly, the leaders of Argentina and Paraguay said the new government illegitimate Venezuela. 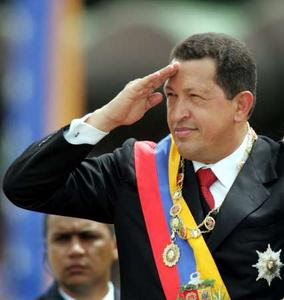 The day after Hugo Chavez was overthrown in a military coup and replaced by Pedro Carmona initiated mostly military officers, Chavez re-confirmed as President of Venezuela (14 April 2002). Pedro Carmona who only occupy as interim president for a day and was forced to announce his resignation after the Attorney General stated that the coup was not legal. Successful Chavez returned to power partly divided military. Some generals did support Carmona, but most soldiers and officers loyal to Chávez medium. In addition, among the poor even Chavez is so popular that when he was ousted thousands of people protested that reaffirmed Chavez as president. In the action which saw looting, dozens of people were killed. Hugo Chavez was arrested on the island of La Orchila by senior military officials and fly back to Caracas by using helicopters and thousands of supporters hailed. With clenched hands up, Chavez entered the Miraflores Presidential Palace retaken by his supporters. Meanwhile, the Attorney General asserts that the minister under the interim government arrested and a number of military officers charged with military rebellion, including their interim leader who was an economist named Pedro Carmona. Referendum August 8, 2004 as an attempt to overthrow President Hugo Chavez by the opposition re-done, but still won by Hugo Chavez with 58 percent of the vote. The victory made him overcome one of the biggest challenges in his reign and make it as a mandate to continue the "revolution for the poor" it. In the December 2005 legislative elections, Chavez's party had swept clean the whole seat parliament after opposition parties boycotted the election.